This came a few days ago and it's been hovering on my desk ever since. I keep picking it up and sighing, while listening to the scrape of snow shovels on ice outside my window. If I hold this pattern up to my ear, I can hear — faintly, how faintly! — the song of the ice-cream truck and far-off illegal fireworks, instead. All summer in a few pieces of yellowing paper. A commenter yesterday suggested that I goose the charity campaign along by posting some drabbles BEFORE we hit the goal, and I'm game. In fact, I will WRITE SOME TO ORDER. Here's how to play: send me a link (a LINK ONLY PLEASE, please do not attach the actual picture) to a vintage dress and I will choose three from all the ones that are sent to me by midnight Central time tonight, and write drabbles for those for tomorrow through Friday. Sound good? I'll also try to set up that Paypal button later today. In the meantime, if the widget below doesn't work for you, here's the link directly to the ChangingThePresent page …we're up to $1060! Thank you! At least you have the sense to suggest making that in a solid color–I’d be crazy enough to choose a stripe that could be made into some kind of bizarre optical-illusion thing on the bodice.That’s a winner, though. I swoooooned when I saw today’s dress. How perfect! I’m very much looking forward to seeing the finished product. I’m actually wearing a dress very much like that one today. Strange eh? I’m wearing two full-length petticoats, thick tights, boots and cardiagan coat to keep warm, though.I got mine from Monsoon, and you were kind enough to write about it a year or so ago. Wouldn’t a black and white version remind you of a maid’s uniform? I think I’m in love! Be sure to make this one up soon and post pics! Love it! I would do dark chocolate brown silk dupioni with parchment piping or scarlet. 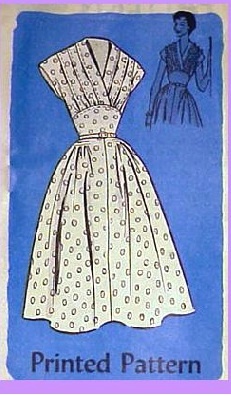 I think that dress would look great layered over a ribbed turtleneck… if one felt compelled to sew it up before April. What a lovely pattern! The pleated version, definitely, and yes, silk dupioni, black or some lovely jewel tone..ahh…heaven. I was just coming back to say, “Why wait?” and I see I’m not alone. A long- or 3/4-sleeved tee underneath? Nice tights? Cheery, no? Wouldn’t that just warm the cockles of my heart during the bleak dog days of winter! I made that dress! Not that exact dress but after seeing Helen Mirren (here: http://www.viewimages.com/Search.aspx?mid=76942040&epmid=3&partner=Google ) wearing it and knowing I wouldn’t be able to find it anywhere, I made it! It was my first dress as well. I had to cannibalize a few patterns and pleat a bunch of interfacing to I knew what shape to cut out of the fabric, but it was entirely worth it. I used a dark navy blue jersey. It is a smashing and an ultra flattering dress. What if you wore it with a huge warm cardigan…? LOVE it, and I’m so impressed with tripthepeach! I was having similar thoughts about how I could copy it…the pleats being the intimidating part. But surely I have some fabric I can mess around with to figure it out.